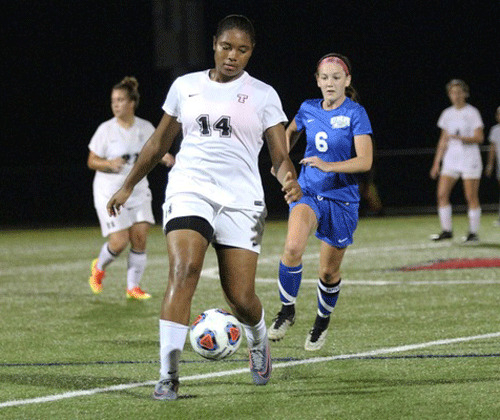 Taznae Fubler’s teammates Cassie Contigiani and Julia Smith each scored hat-tricks as the Thomas College Women's Soccer team defeated UMaine-Presque Isle 10-0 in a North Atlantic Conference (NAC) match. Contigiani picked up her hat-trick in the first 23 minutes, with Sam Cleaves and Katherine Hoving also tallying goals in the first to put Thomas up 5-0 at the half. Smith picked up her first in the 53rd minute, followed by scores from Hoving and Makenzie Carlow. Smith finished her hat-trick late, scoring in the 88th and 90th minute to give Thomas the 10-0 win. Smith also added three assists in the game to give her nine points on the day. Kayla Gordon earned the win for Thomas, making one save in the first half before Samantha Griffin played in net in the second half.